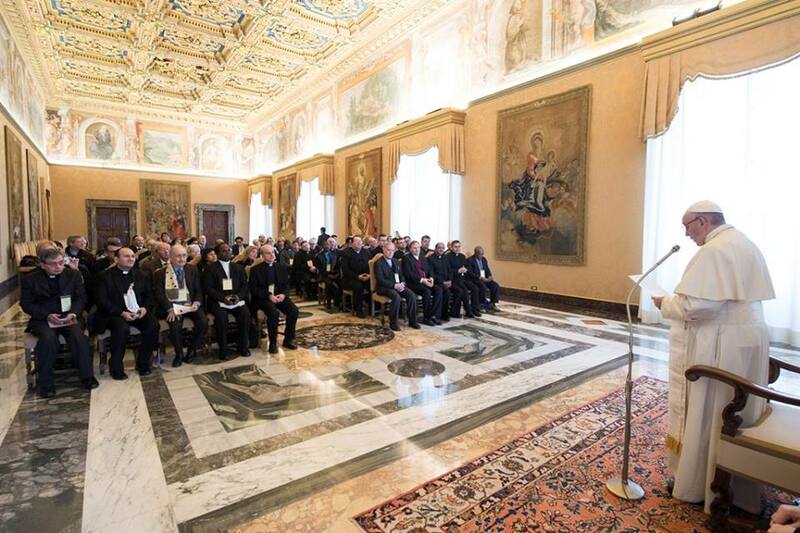 Pope Francis held an audience with international members of the Apostolic Confederation for the Clergy in the Vatican on Thursday. “Behold, how good and pleasant it is when brothers dwell in unity!” (Psalm 133,1). These verses of the psalm go well after the words of Msgr. Magrin, impassioned president of the International Confederation Apostolic Union of Clergy. It is truly a joy to meet and to feel the fraternity that arises among us, called to the service of the Gospel following the example of Christ, the Good Shepherd. To each one of you I address my cordial greeting, which I extend to the representatives of the Apostolic Union of the Laity. In this Assembly you are reflecting on the ordained ministry, “in, for and with the diocesan community”. In continuity with previous meetings, you intend to focus on the role of pastors in the particular Church; and in this rereading, the hermeneutic key is the diocesan spirituality that is the spirituality of communion in the manner of the Trinitarian communion. Msgr. Magrin underlined that word, “diocesan”: it is a key word. Indeed, the mystery of the Trinitarian communion is the high model of reference for the ecclesial community. Saint John Paul, in his Apostolic Letter Novo millennio ineunte, recalled that “the great challenge facing us in the millennium which is now beginning” is precisely this: “to make the Church the home and school of communion” (43). This involves, in the first instance, “[promoting] a spirituality of communion, making it the guiding principle of education wherever individuals and Christians are formed” (ibid). And today we have a great need for communion, in the Church and in the world. One becomes an expert in spirituality of communion primarily thanks to conversion to Christ, to the docile opening to the action of the Spirit, and by welcoming one’s brothers. As we are well aware, the fruitfulness of the apostolate does not depend only on activity or on organizational efforts, although these are necessary, but firstly upon divine action. Today as in the past the saints are the most effective evangelizers, and all the baptized are called to reach towards the highest measure of Christian life, namely, holiness. This is even more applicable to ordained ministers. I think of worldliness, the temptation of spiritual worldliness, so often concealed in rigidity: one calls the other, they are “stepsisters”, one calls the other. The World Day of Prayer for the Sanctification of Priests, which is celebrated every year on the Feast of the Sacred Heart of Jesus, constitutes an ideal opportunity to implore of the Lord the gift of zealous and holy ministers for His Church. To achieve this ideal of holiness, every ordained minister is called to follow the example of the Good Shepherd, who gave His life for His sheep. And from where can we draw this pastoral charity, if not from the heart of Christ? In Him the celestial Father has filled us with the infinite treasures of mercy, tenderness and love: here we can always find the spiritual energy indispensable to be able to radiate His love and His joy in the world. And we are led to Christ every day also in the filial relation with our Mother, Mary Most Holy, especially in the contemplation of the mysteries of the Rosary. Closely linked with the path of spirituality is commitment to pastoral action in the service of the people of God, visible today and in the concreteness of the local Church: pastors are called to be wise and faithful servants who imitate the Lord, who don the apron of service and bend to the lives of their communities, to understand their history and to live the joys and sufferings, expectations and hopes of the flock entrusted to them. Indeed, Vatican Council II taught that the right way for ordained ministers to achieve holiness is in “[performing] their duties sincerely and indefatigably in the Spirit of Christ”; “by the sacred actions which are theirs daily as well as by their entire ministry which they share with the bishop and their fellow priests, they are directed to perfection in their lives” (Decreto Presbyterorum Ordinis, 12). You rightly highlight that ordained ministers acquire the right pastoral style also by cultivating fraternal relations and participating in the pastoral journey of the diocesan Church, in its appointments, its projects and its initiatives that translate the programmatic guidelines into practice. A particular Church has a concrete face, rhythms and decisions; it must be served with dedication every day, bearing witness to the harmony and unity that is lived and developed with the bishop. The pastoral journey of the local community has as an essential point of reference the pastoral plan of the diocese, which must take precedence over the programmes of associations, movements or any other particular group. And this pastoral unity, of everyone around the bishop, will bring unity to the Church. And it is very sad when, in a presbytery, we find that this unity does not exist, it is apparent. And there gossip reigns: gossip destroys the diocese, destroys the unity of presbyters, the unity among them and with the bishop. Brother priests, remember, please: we always see bad things in others – because cataracts don’t appear in this eye – eyes are always ready to see ugly things, but I urge you not to arrive at gossip. If I see bad things, I pray or, as a brother, I speak. I do not act as a “terrorist”, because gossip is a form of terrorism. Gossiping is like through a bomb: I destroy the other person and go away calmly. Please, no gossip, they are the like the woodworm that eat through the fabric of the Church, of the diocesan Church, of the unity among all of us. Dedication to the particular Church must then be expressed more broadly, with attention to the life of all the Church. Communion and mission are correlated dynamics. One becomes a minister to serve one’s own particular Church, in obedience to the Holy Spirit and one’s own bishop and in collaboration with other priests, but with the awareness of being part of the universal Church, which crosses the boundaries of one’s own diocese and country. If the mission is an essential quality of the Church, it is especially so for he who, ordained, is called to exercise the ministry in a community that is missionary by nature, and to educate in having a world view – not worldliness, but a world view! Indeed, mission is not an individual choice, due to individual generosity or perhaps pastoral disillusionment, but rather it is a choice of the particular Church that becomes a protagonist in the communication of the Gospel to all peoples. Dear brother bishops, I pray for each one of you and for your ministry, and for the service of the Apostolic Union of Clergy. And I pray also for you, dear brothers and sisters. May my blessing accompany you. And remember: do not forget to pray for me too, as I am in need of prayers! Thank you.